SEO for conference marketers. Let’s be honest. Do you know what that means or did you stumble in here to our little chat by accident? Or were you pushed? Conference or association website not performing like it used too? Traffic down? New blood not finding their way to the member roles or conference box office? No matter? How you got here is irrelevant to me. I am just happy you are here because we have ten awesome resources so you can work smarter. The simple truth is, not too many association and conference marketers know what SEO is or how it works. This is not a dig, it is just the truth. How could you know? We are all up to our eyeballs in planning conferences, BEOs, member drives, non-dues revenue, sponsorships, exhibit planning, CMEs, and CEUs and SEO is a freaking HUGE subject. Basically, it is the act of designing your content and descriptions so they are search engine friendly. And by search engine friendly, we mean Google because Google is the only search engine that matters. You are going to make your website and every speck of content, Google Friendly. Since this post cannot possibly cover all of the things that you need to do to become a search engine expert, we are going to point you to ten of the most awesome resources out there to save you a bunch of time and a lot of heartaches. These are trusted sources, legit if you will, because one thing you will learn is that there is a good way to do SEO and a bad way to do SEO. Whiteboard Friday. That is all we need to say about Moz. These guys are mack daddy of search, probably the best in the business. In fact, down at the bottom of this post, you will find a nifty little infographic. Came from these guys. Content marketing is to search as sauce is to spaghetti, they don’t need to work together but everyone is much happier when they do. CMI is full of stuff that every association and content marketer should know including stuff on SEO. They have a magazine, run huge events, and even do some consulting. Totally hip dudes and dudettes. Content, content, content. They bring in guest contributors all the time so it is always fresh and always current. A recent post is right up any conference marketers alley – 3 Simple Ways to Build a Winning SEO Strategy on a Shoestring Budget. In the event industry? Then you know Hubspot. Head to the marketing blog to get your fix of articles that includes SEO topics. The name says it all. One recent headline pops out to me because I see it all the time with many association sites – Make no mistake: content errors harm your brand and SEO. Metrics is in the name. Once you start your SEO journey, you will have data, KISSmetrics is where you can read up on what to do with it. A recent title – How Site Search is Killing Your Conversion Rate. Rather than news, this site deals with the how-to. Read about x on site a, wait for HigherVisability to tell you how to implement. A recent post title – 10 Skills Every SEO Expert Should Have. They create and sell a tool for internet marketers. They produce useful content to drive people to their site to buy that tool. You might benefit from both. The Google Blog is a must read for all things Google including search. Heck, you should read this blog even if you don’t have anything to do with marketing. 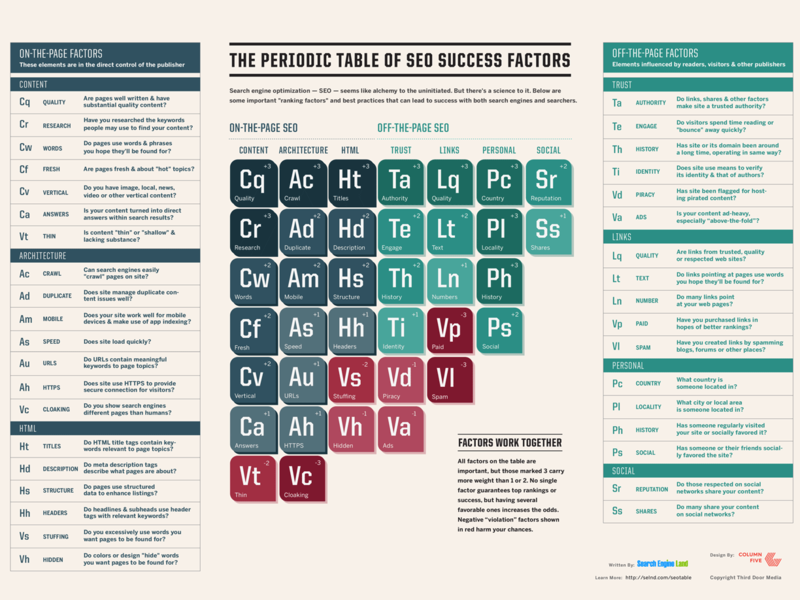 As mentioned above, here is a cool infographic from SearchEngineLand, one of our resource pics.